I knew nothing about the character of Tor when I stumbled across this comic at an antique store (Junk store would be more accurate) a while back. All I knew is that it had a great Joe Kubert cover, was in surprisingly good condition for being unbagged and in a stack of battered Richie Rich and Archie comics, and was only going to cost me two lousy bucks. . . But what I like about these Retro Review editions of Longbox Junk is that, beside reading and reviewing comics that have probably never been reviewed, I take the opportunity to try and learn a little about the background of the issue at hand and share a bit of what I come to know. What I found out about this particular comic is that even though it is from 1975, it was actually written and drawn in 1959 as part of a failed pitch to publish Tor as a newspaper comic strip after the character had appeared in a short-lived (5 issue) series in 1953-54 . This issue is an expanded and colored version of the 12 sample newspaper strips. While Kubert is famous for other characters such as Hawkman and Sgt. 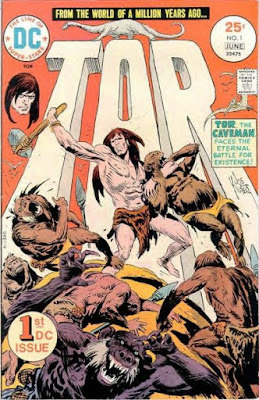 Rock, Tor was one of his own creations. . .thought up while Kubert was on a troop ship during the Korean Conflict in the early 1950's when the legendary artist was still pretty much unknown. From what I could find out, Tor held a special place in Kubert's heart for being one of the first characters that he created, even though Tor never really caught on with readers as much as his other work. So let's take a closer look at this early work of the great Joe Kubert, shall we? First off, what a fantastic cover! The bright, primary red background, the title rising up high behind the main character, who stands fighting off a horde of ape-like creatures. It's bold, dynamic, and classic Joe Kubert. It REALLY catches the eye. Unfortunately, the cover is the best of the art on this issue. Joe Kubert was a legend, but he wasn't ALWAYS a legend. You can plainly see that this comic is some of his early work. The art inside isn't BAD by any means. Rough Kubert work is still better than a lot of other artists best work, but this is certainly not his best work by a long shot. That said. . . even though the art is somewhat rough, there are still some pretty excellent panels that I assume are part of the later expansion from newspaper strip to comic book. It's bookended by an introduction and epilogue featuring Joe Kubert himself describing the genesis of the character, and is narrated as if it is a story being told by Kubert to the reader. I really liked this method of narration. I felt it added a very personal touch to the story and the character. The story itself involves Tor during a hunt thinking back to his younger days when he was badly beaten by a warrior from a rival tribe for trespassing. He asks his father to help him learn to fight and is sent into the wilderness to find a handle for an axe. While searching, Tor is attacked by a river dinosaur and is saved by the same tribesman who beat him earlier. In turn, Tor saves the rival tribesman from drowning and their debt to each other is declared even. In the end, Tor learns that it is possible to win a battle in other ways than fighting. Overall, I liked the story a lot. It reminded me of some of his stories featuring the greatest anti-war war hero ever written, Sgt. Rock, in that sometimes what you might THINK is the solution to a problem might not be the best way to solve it after all. It's a story that's been done over and over, but it still rings true. It's an extremely simple story when you get right down to it, but in this issue, Kubert tells it well. So while the story itself was straightforward, timeless, and enjoyable, I couldn't help but be a bit put off by the overall feel of the setting. Maybe it's because Tor is a product of the 1950's, but there's a part of me that had a really hard time accepting humans and dinosaurs living together, clean-shaven (and as The Walking Dead's Abraham put it, "Dolphin Smooth") Neanderthal tribesmen, and a completely utter disregard for biological accuracy of the dinosaurs. Okay. . .I get it. It's an action story set in prehistoric times. There's some artistic wiggle room. But there's a difference between wiggle room and just throwing all scientific knowledge out the door. If Kubert had just set this tale in some sort of a "Lost World' scenario (Like Turok or Ka-Zar) this would have not even lifted my eyebrow, but it's not. So my comic suspension of disbelief was severely put to the test by this whole setup. In addition to the main story, there is also a 1 page text feature about the dinosaur monster movies that inspired Kubert to create Tor. It was actually pretty interesting, for a proto-Wikipedia page. There was also a 2 page text piece by Allan Asherman on the character of Tor and his previous appearances, along with a montage of a few pieces of the art from the earlier Tor series from 1953. I found it to be somewhat interesting (in the same proto-Wikipedia way as the dinosaur movie page described above) but a bit unnecessary. All in all, I really liked this comic. It has a fantastic cover, decent art, and a good story. The setting is ridiculous and the extra text information features feel like unnecessary page padding, but the good here outweighs the bad. It's a bit of a shame that Tor never really caught on. I can tell just from this issue alone that Tor held a special place for Joe Kubert. Perhaps with a different setting that didn't throw scientific knowledge completely out the window, this series would have gained the legs it needed to stand alongside the legendary artist's more popular work. Longbox Junk business as usual when we find out if a Star Wars vampire story can possibly be any good. Be there or be square!